Old Figures - New Games. 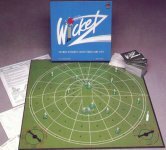 Capri Knockout cricket was a mid-1970s board-game, which looked to cash-in on the new "limited overs" version of cricket. (The rules were copyright 1976). All the action took place using two packs of cards and a die. The bowler would start by taking the top six cards from the bowling card pack. He was allowed to exchange one if he wanted, and could bowl them in any order. Once he had seen the cards, he could set up the fielders. Once set up, he could then only move two fielders during the over. The bowler cards usually had two pieces of information on them representing line and length i.e. "Outside Leg Stump/Full Toss". The batsman was allowed twelve batting cards in response. These could be sorted into "defensive", "off-side" and "leg-side" cards. These cards also had two pieces of information on them, showing which balls you could use the card against, and the resulting shot. So you might get "outside leg stump. Good length/Leg glance to deep fine leg". Once a batting card was used the batsman replaced it, so he always had twelve cards. There were a couple of special balls for the bowler, the "yorker" and and "bumper and beamer". Both needed a special batsman card to negate. The yorker lead directly to a bowler appeal, and the bumper forced the batsman to play with one less batting card until a wicket fell. The die was used to determine the number of runs for each shot. If the number and direction matched to a fielder, then the batsman was caught. There were also bowler appeal cards, wicket-keeper cards (byes and stumping), and fielder appeal cards for run-outs. The other components aren't up to Subbuteo standards sadly. The sightscreens and the (admittedly huge) scoreboard are only made of card. thanks to Ian Moore for providing the photos and info on this game. Capri also produced a couple of companion games for this set, including an athletics set, and a mountaineering game. Sadly, the plastic pieces in these sets are a much poorer quality than the lovely Subbuteo fielders. "The most authentic cricket board game ever." The game is great fun to play, and the basics are easy to pick up. The bowling side places his fielders into sections of the field, and then spins the bowling indicator to produce a delivery. Some are good deliveries, and some are poor. The batsmen then uses this information to decide which type of shot to play. There are nine attacking shots in various directions, and four defensive shots. Once he has announced his shot, the batsman turns over the top batting card, and reads the results. Depending on the type of ball, the type of shot, and the field placing, there is a chance of runs, or a wicket. If the player is called out, then he still has a chance with the "out/not out" spinner. Batting is entertaining and a little nerve wracking, but bowling can be a bit tedious - just a case of spinning the indicator, and moving fielders now and again. At least the advantage of this is that it makes for great solo play. There were several versions of Wicketz produced. The original "green box" version shown on the left was copyright 1988, and had a basic feel to cards and rule sheet. You can see that the cards were rather plain. The blue box set on the right is one of a pair of sets copyright 1994, which had an improved logo and more of a professional sheen to the components. The cards now had an attractive backing, and the rules sheet had new cartoon illustrations. As mentioned, the 1994 version of the game was produced in two versions. The blue box illustrated was the basic set, and featured a plain plastic inner, with all the components stored in the three hollows in the middle of the box. The players in this set were supplied unpainted. The deluxe set had a green box. This is not illustrated, but imagine the blue box in the colour of the cards. This had painted players laid out as they were in the original set. My original green set also had a set of sight-screens included, and the basic blue box set does not have these. The other Wicketz set worth mentioning is this giant wooden edition. A limited edition set (it may have even been promotional), it came in a lovely wooden cabinet with four drawers, each containing seven painted county (or test match) sides. Each side has a "brass" name plaque next to the team. The rules and cards date this with the mid-1990s sets. As I've mentioned, the Subbuteo connection is with the figures of course. The sets used all the types of fielder, batsman and umpire. The figures were perhaps not as fine castings as the originals, but they are pretty close. In a clever touch each batsman had an extra rotating ring around his base, which was used to indicate their batting position from one to eleven. The sets included a flyer offering the chance to buy extra teams and accessories. You could buy the figures in different colour plastics, or hand-painted in international and county sides. The pictures here hopefully shows how nice the players look. RDA Marketing also sold the Subbuteo sight-screens, deck chairs, roller and the scoreboard, the latter being recast in black plastic with the Subbuteo logo covered with a Wicketz one. 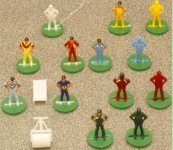 The wicketz players were sold in a variety of different coloured plastics, allowing one-day sides to be quickly and easily painted. The plastic colours I've seen are red, dark red, green, dark green, blue, light blue, yellow, grey, and an odd purple/navy. 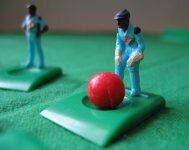 The problem for anyone looking for extra Subbuteo cricketers is that the fielders were not on catching bases. 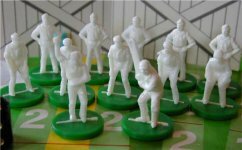 However, the players were available loose, and can be used if you can successfully remove broken Subbuteo cricketers from their bases (hot water and a screwdriver are recommended). 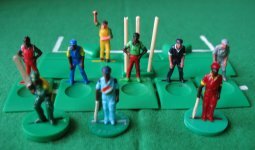 As shown here, these figures can brighten up a game of Subbuteo cricket very successfully. The Wicketz website seems to have ceased, and the game also seems to have stopped production, which is sad. This was a true clone of Subbuteo cricket made exclusively for Tom Taylor's Welsh table soccer shop - Peldroed Borth. The game was sold in a long thin black box, priced at £34.99. Anchorman was made in India, and the probably the most unusual thing about it is that most of the components, including the figures, bases, bats, and the measuring triangle were made from brass. The playing surface was a lovely baize, matching the rectangular Subbuteo version. This was designed so it was easy to play on a standard table soccer board (which Tom Taylor's shop also produced). The actual bowling strip was a piece of wood covered in cloth, into which the brass stumps were placed directly. 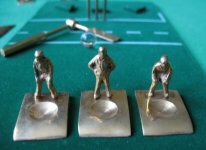 Whilst the fielders were a brass copy of the Subbuteo set, the bowler was a new and improved design as shown above. Another innovation were the fielder extensions, which represented the reach of the boundary fielders more realistically. 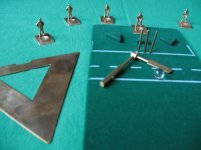 These were of a simple (but effective) wooden design, and one could also be used as the wicket-keeper stop as provided in the Subbuteo version. 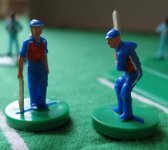 Tom Taylor also extended his infamous "Subbuteo Streakers" range, to include a cricket version to accompany the set. Sadly, these sets were made of plastic, so jokes about freezing brass monkeys are (even more) inappropriate. 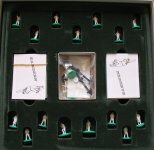 If anyone finds any other Subbuteo figures turning up in other games, then please let me know.